I never cease to wonder how little knowledge go a long way. I have not changed my camera – I still use a basic and very old point and shoot camera. But armed with little know-how has changed my photography. 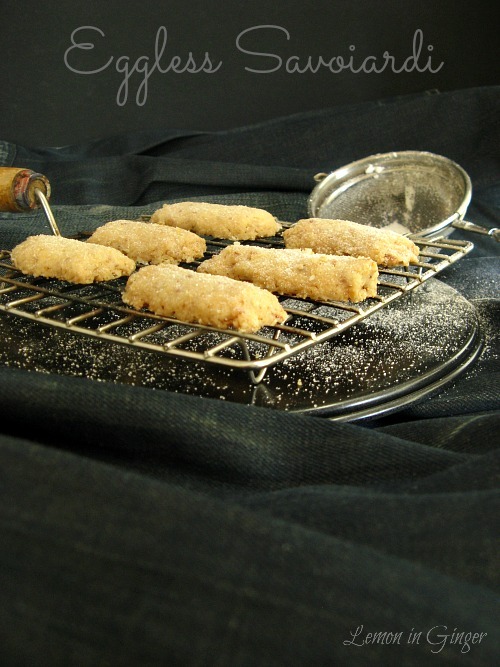 A testimony to which is the Revisiting Food Photos Through the Lens Series. I started my blogging journey with Eggless Tiramisu 2.5 years ago. Not only photography was new to me, baking, blogging, frosting, assembling – every single process was relatively new to me. Though the earlier photos of Tiramisu are downright shoddy, but the taste was unbeatable. Since then V has been asking me to make it again. I did make a variation with Eggless Orange and Fig Cheesecake but a coffee laden classic tiramisu is an unparalleled dessert. For V’s birthday I re-visited the Eggless Tiramisu and made from scratch. If you are a regular reader here you would know how important baking cakes/ goodies on family occasion is to me. Once I kept my Tiramisu for setting, I realized that I wanted to give some extra finish from the outside. 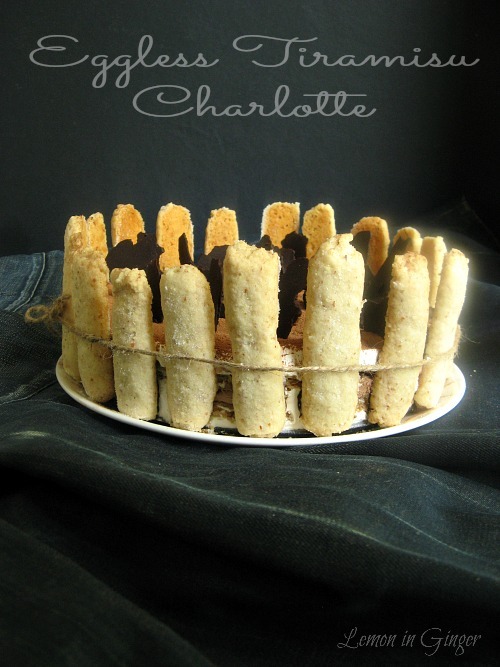 Initially I contemplated doing chocolate collar or filigree, and then I came across few posts on Tiramisu Charlotte by wrapping the same or other variation of Tiramisu in ladyfingers or savoiardi. 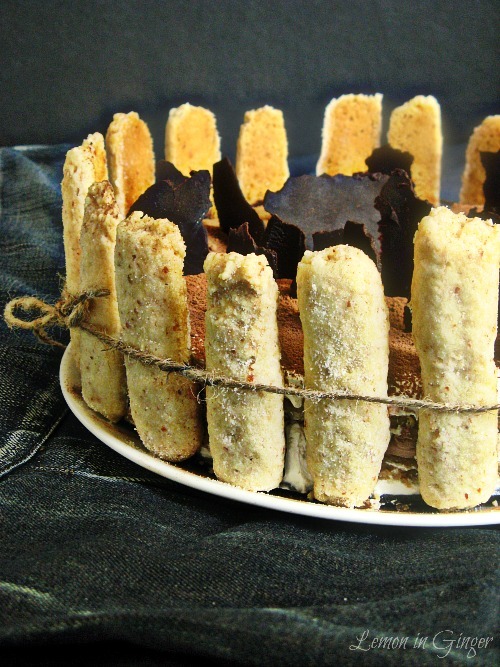 I made another batch of ladyfingers to wrap them around the already set Tiramisu. 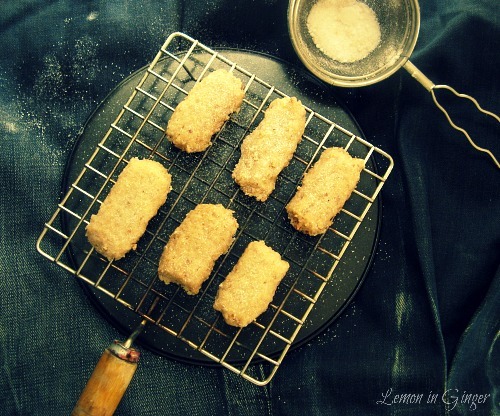 My ladyfingers were slightly long and I felt would have looked better short. It would have also given me more savoiardi to cover around closely. For photography, I did not change much except my knowledge and more importantly the use of it. Photography set-up: North facing window, black cardboard as background, hubby’s white shirt to diffuse light, shot at 10:00 am, side lighting, white foam board for reflection, props used from the kitchen, Canon AS710 IS P&S Camera. Practically didn’t change much or bought extravagant props, but simply learning to apply my knowledge. Lately I have started using our clothes as background. I decided to put them to good use since it no longer fits me and they are far pretty to be thrown away. Who am I kidding? I guess the real reason that they are memories of long gone days when I could fit into them! I posted on Google+ seeking some feedback on hiding the tell-tale signs like seams, pleats, etc of a stitched garment. If you have some pointers, I would love to hear about them. A beautiful and delectable dessert. Perfect for special occasions. The dessert just melts in your mouth and tastes divine. Melt butter and chocolate together using double boiler or in microwave with 30 secs spurts. Quickly spread a very thin layer of melted chocolate-butter mixture on the back of a clean baking sheet. Allow it set briefly in a freezer. Remove it when you can see a slight mark of your thumb. Using a bench scraper gently start removing chocolate from the sheet and it will automatically curl. Remove the ring of the springform pan. Move the Tiramisu to the cake stand. Melt some chocolate using double boiler method or in microwave using 30 secs spurts. On the backside of savoiardis spread the melted chocolate with the help of a spatula or spoon. 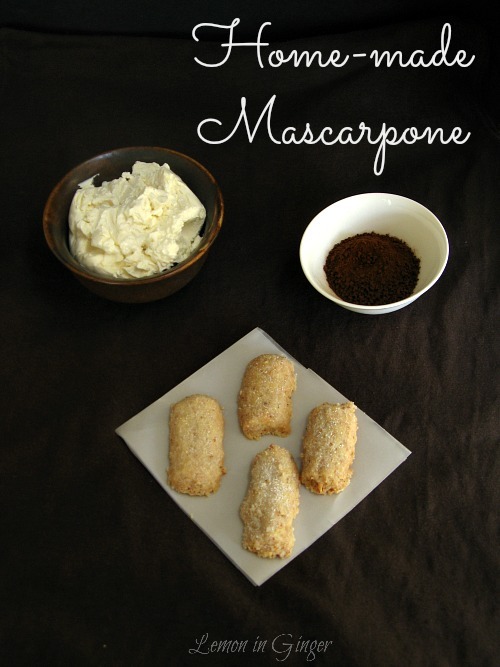 Quickly wrap them around the set Tiramisu. Tie around with a string/ ribbon. Top with some chocolate curls and unsweetened cocoa powder. 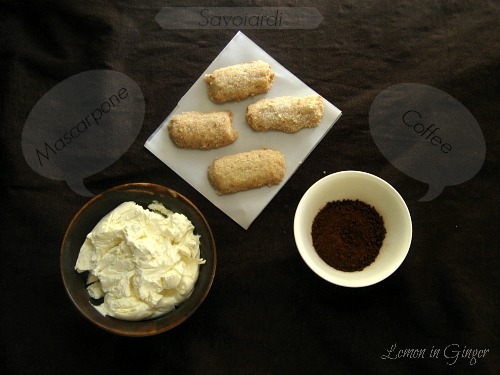 I used piping bags to pipe out the ladyfingers/ savoiardi. I whipped the cream at home. Since I used unsalted butter, I reduced the sugar used in assembling to 1/3 cup (as in original recipe). I used a springform pan to set the dessert. I made 2 batches of Savoiardi to have extra to wrap-around the Triamisu.